Let's pick an experience that is right for you! 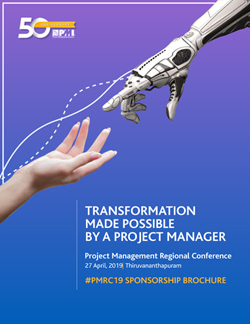 Be at the top of mind with attendees at the region’s most sought-after Project Management event, with delegates from across the region, industries and verticals along with representations from PSU’s and the government. PMI has a comprehensive sponsorship programme that offers you pre-fixed packages — you select the package that best suits your business needs, and we will connect you with a network of attendees ready to solve challenges and prepare their organisations for the future. Options are available for sponsors and exhibitors that are reaching beyond just the live event. Email sponsor@pmi-india.org to learn about available opportunities.